The Hurtless Hunt is just one of the activities in Do Unto Animals that helps us to get amongst creatures in their natural habitats, without disrupting their environment or their well-being. In the book, Tracey reminds us that the closest we may ever get to some animals is through the footprints they leave behind. The Hurtless Hunt contains lots of good tips and tricks for tracking animal prints, while remembering to keep our distance, be respectful, and be careful not to frighten animals or encroach on their turf. If you and your family have gone out tracking and returned with a notebook filled with track prints you've identified, then put your findings to use and make some tracking stamps. Our craft contributor, Jodi Levine, showed us how to make the easiest stamps using cardboard and adhesive foam. 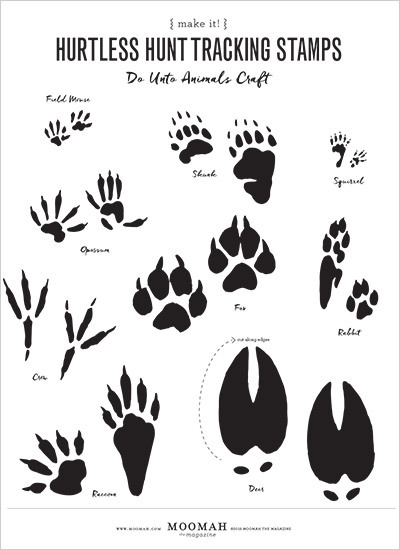 Use the footprint sketches from your own Hurtless Hunt (or print and download our template) and leave some footprint tracks of your own. Use your stamps on whatever you please! 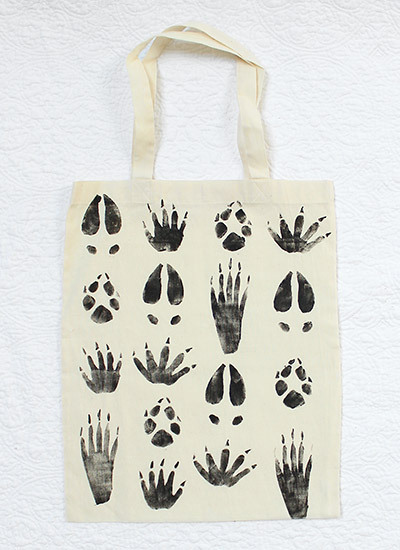 We made a tote bag. 1. DOWNLOAD and PRINT the Hurtless Hunt Tracking Template. 2. 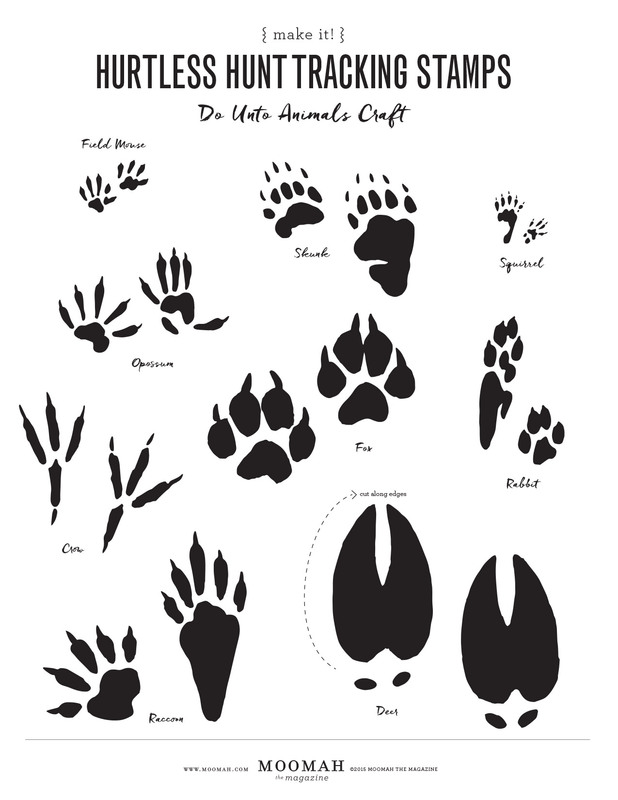 TRACE the silhouette of each footprint onto adhesive foam and CUT into individual prints. We suggest cutting one footprint at a time as to not leave any piece behind. 3. PEEL the sheet off the back of the adhesive foam pieces and STICK onto cardboard. Be sure to stick the pieces in the shape of each footprint. 4. Once the footprint has been transferred onto cardboard CUT around the shape leaving a 1-inch border. Now you have your stamp! 5. FLIP your stamp foam-side down onto the ink pad and PUSH the foam into the ink pad. 6. CHOOSE a place to stamp your footprint and PRESS down firmly. Carefully lift the cardboard upwards to reveal your stamp. Posted in: Companion Crafts Crafts: Make It!